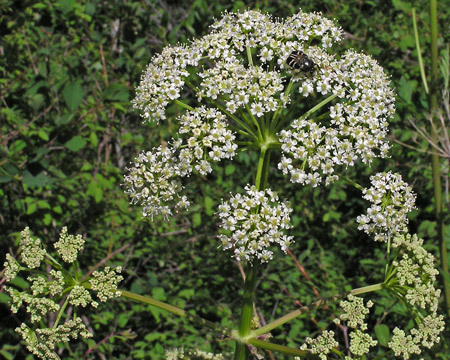 Cow Parsnip and Love Root are close relatives and if you mentally cut a Cow Parsnip leaf into a lacy, fern-like leaf and reduce its flower size considerably, you end up with a plant that looks like Loveroot. The two plants enjoy similar habitats and are commonly found near each other. Both are quite common in the mountains of the Four Corners area but Loveroot is by far the more common of the two, growing along almost all trails and often growing in thick, extensive patches. See Cow Parsnip. Montane, subalpine. Woodlands, openings. Summer. Love Root is very common in the San Juans and other Four Corners mountains and often grows in dense stands covering acres under Aspens and in meadows. 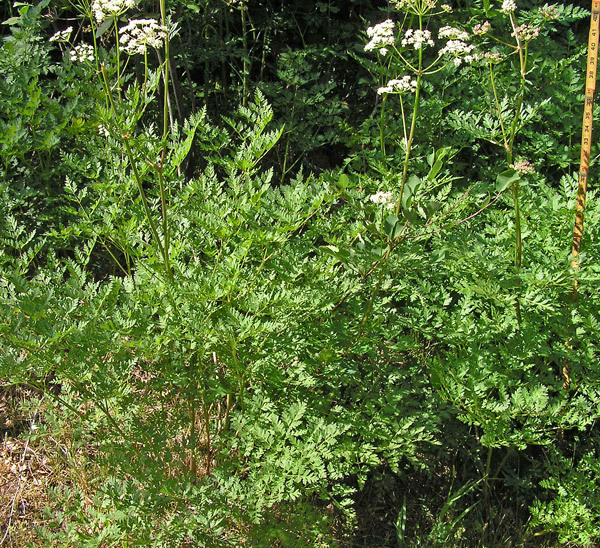 A mass of large, fern-like leaves arch upward to two or three feet and are followed by three-to-six foot flower stalks. Flower heads open to four inches across. 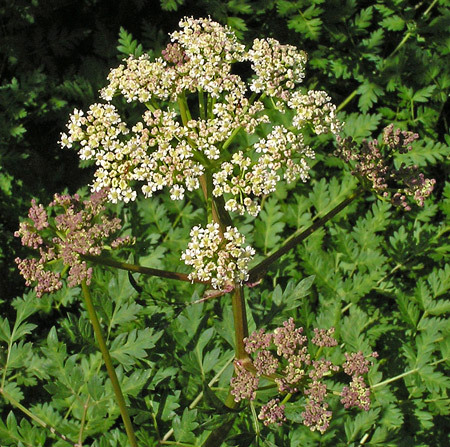 Being a common plant sometimes means that you will have many common names; this certainly is true of Ligusticum porteri. 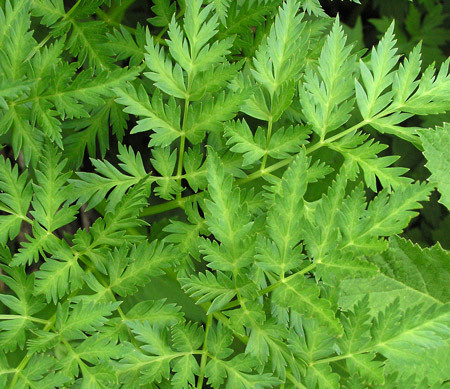 It is called Loveroot, Lovage, Porter’s Lovage, Porter’s Ligusticum, Osha, Chuchupate, Licorice Root, and Wild Parsley. 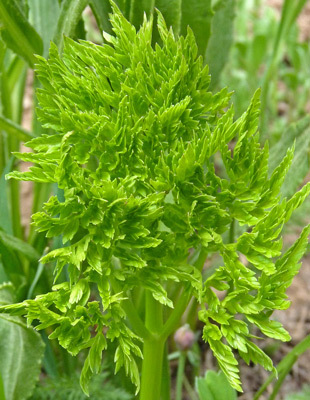 Ligusticum porteri is commonly used for what many people believe are its potent medicinal properties. Some people grind and use the entire plant, some just the highly aromatic roots. See WebMD and the Alchemist's Kitchen. 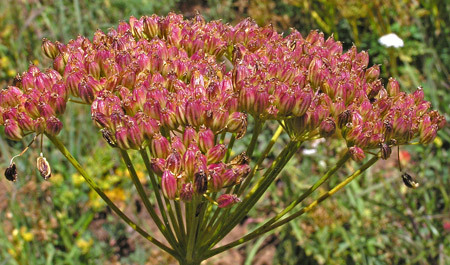 "Ligusticum" is Latin, and probably means "from the Liguria region of Italy", where a related plant, Lovage, Levisticum officinale, grows in profusion and is widely used as a herb. Pass Creek Trail, June 11, 2010 and Navajo Lake Trail, June 25, 2005. Very young leaves are crowded into a soft green head. It is common for mature Loveroot leaflets to have shades of green -- darker green borders with lighter green centers. A bundle of new leaves give the impression of a feather duster as they sit atop a strong central stem. West Mancos Trail, June 17, 2004 and Stoner Mesa Trail, June 23, 2005. 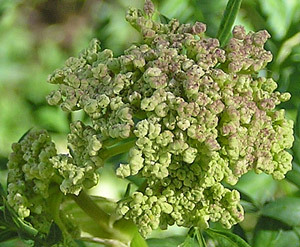 Emerging flower heads are tightly packed and have green, rose, and purple tinges. Eventually clusters spread widely and open bright white. Horse Creek Trail, August 31, 2005. Colorado Trail above Roaring Fork, August 7, 2004. 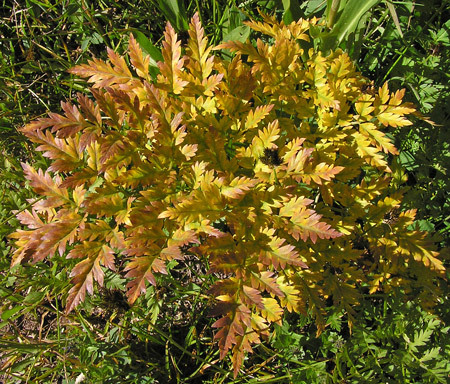 Loveroot turns meadows and forest floors golden-yellow in the fall.